At looooong last, the book is complete. 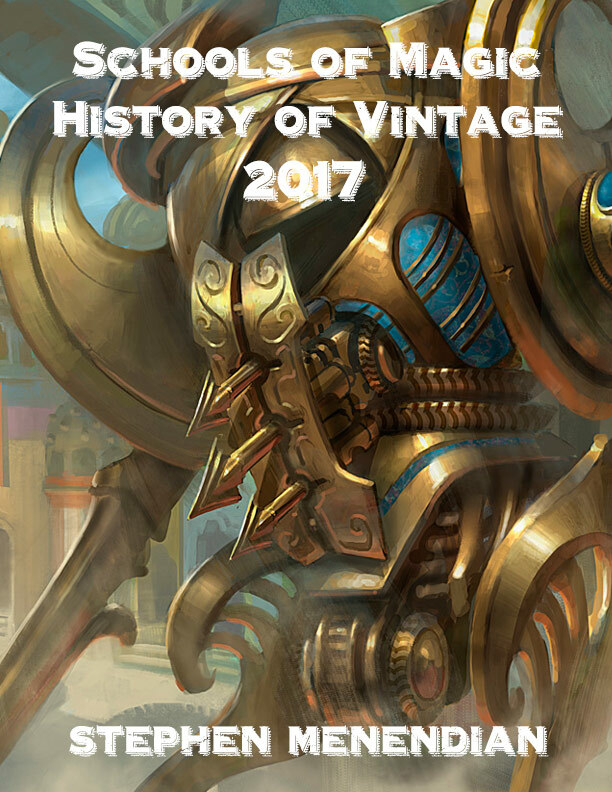 This final installment is the 2017 Chapter, and an 8 page conclusion to the entire book, which summarizes all of the schools of Magic and offers some commentary on the arc of the format over 25 years. I'm quite proud of this work! Enjoy! Serious congratulations on making it to the end of this monumental effort. I look forward to picking up a copy when it gets compiled into a book. I look forward to picking up a copy when it gets compiled into a book. Do we have any idea when the whole series will be available as an e-book? I want to know if its worth buying each seperate chapter now or wait until it releases as a whole. Remember that the earlier chapters were written years ago. The editor and I have to go through the entire book with a fine tooth comb (I've already re-written and expanded the Introduction and Chapter 1 - but it hasn't been uploaded yet). Then we have to format it for a physical book, and work on the layout. There are a number of places I want to 'touch up' and update the book. It's really up to you whether you want to wait or not, but my guess is September or October. Chapter 1: 1993 has been completely updated and revised, along with a completely new and much expanded Introduction. I believe it has been uploaded. We are nearly finished updating Chapter 2: 1994. I found a number of hidden decks on the USENET that have never been published before. I found them using a new search technique, and hunted down leads. This will be uploaded soon, but we are also adding a new section on Revised Edition, that I've yet to complete. I believe Jaco's plan is to send folks who already purchased chapters copies of the 'final' chapters once the book is finalized. But it won't be too long before folks who want to start at the beginning can do so with updated versions of the chapters. We are still a ways away from converting it to a physical book. Just to see how big the whole thing is, I converted the PDFs into a single file, and it's over 680 pages without actually resizing the whole thing for a physical book form. Granted, alot of the 'back matter' can be removed or streamlined, but it's still probably too big for a physical book the dimensions of the Gush book at that size. So we are going to investigate alternative options, including a different size like a coffee table book. This will take a while, since we have to go through and finish updating the chapters first anyway. Thanks for the update. Will owners of all the chapters get the compiled e-book for a discount or for free when it is done? Yes, anyone who has purchased every chapter will receive the full book in PDF form once it has been re-edited, recompiled, and refactored for full publishing. Those buyers were the original "kickstarters" so to speak, and will be taken care of a couple of different ways. Hi, looking forward to the book. I really appreciate your articles and podcast, which have helped me get back up to speed after time away from the game. Any chance you will be releasing the book through the Kindle store, or on another format that plays nicely with e-readers? I loved part 1 (and I'm sure I'll love the rest). I also look forward to the printed version. Thank you for putting this together.